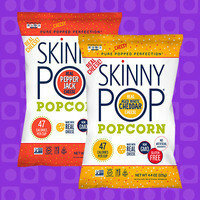 Cheesy popcorn with amazing flavor, low calorie counts, and large portions? Sign us up! The Pepper Jack flavor is SO delicious (it's got some heat to it), but the bold Aged White Cheddar is the reigning favorite at Hungryland. Grab a bag (maybe one of each?) ASAP... Available nationwide! 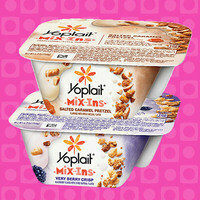 Yoplait has finally gotten into the yogurt + sidecars of mix-ins game! This line is perfect for anyone who likes the idea of Chobani Flips but prefers traditional (not Greek) yogurt. Try the Very Berry Crisp, Cherry Chocolate Almond, Salted Caramel Pretzel, Coconut Chocolate Almond, Key Lime Crunch, and Mint Chocolate Delight. Yum! Available at Walmart, Target, and major grocers nationwide, so stock up. If you like to DIY with coffee drinks (we do), these seasonal all-natural creamers should be on your radar. 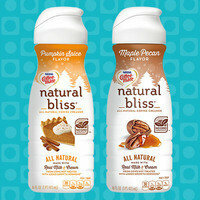 There's the returning favorite fall flavor, Pumpkin Spice (exclusively at Walmart; homemade pumpkin spice latte, anyone? ), and the decadent Maple Pecan (rolling out to supermarkets nationwide). Like all Natural Bliss offerings, they're made with milk and cream from cows not treated with added growth hormone, plus natural flavors and pure cane sugar. They're only here 'til December, so snap 'em up! Yesterday, September 10th, was National Swap Ideas Day... but for us, that's EVERY day! In addition to the daily emails, follow us on Facebook, Twitter, and Instagram for maximum food-swap ideas! Share these major finds with all your besties -- click "Send to a Friend" now.